View cart “There Will Be Peace On Earth” has been added to your cart. An extremely versatile musician, John has toured the country with numerous rock bands, jazz groups, and Broadway performers in their cabaret and concert venues, including singers from the New York Metropolitan Opera and Los Angeles Opera. 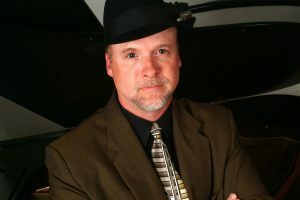 He is currently music director and pianist for the popular jazz group Mike Gurley and the Nightcaps. He resides in Burbank, CA with his wife Debra and two children Carly and Miles, and is very active in restoring and retaining music and arts education within the Burbank public schools. I've known John for almost a decade. He is a spiritually-minded man and an excellent organist. His mastery of Hymnal music and other religious genre music is always apparent. And, he is also an excellent pianist!" --Diane P. Dailey, C.S.B. "I hear pure music and feel inspired when John's playing. There's just pure harmony, expression, and glory. And as an accompanist, he's second to none. He listens better than anyone I've sung with. He expresses the Christ through his music. And not only is his technical skill superb, but he composes moving and inspiring melodies, all of which I've had the pleasure of singing. It's a very special skill to be able to compose for the singer. He does.